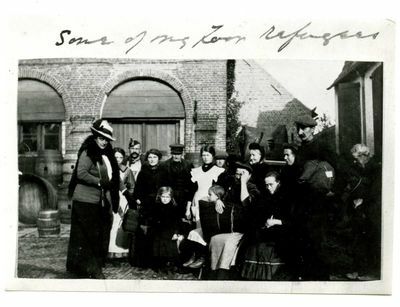 "Maxine Elliott Relief Work in Belgium "
A black and white photograph in the Diana Forbes-Robertson collection on her aunt, Maxine Elliott, an internationally renowned actress born in Rockland, Maine in 1868. Text at the top reads, "Some of my [?] refugees." The back reads, "Maxine in Belgium during her relief work in World War I - probably early 1915." John R. Freeman & Co. photographers, marked with the number 91299. Saved near an article clipped from the April 4, 1915 edition of The Boston Sunday Herald, "Maxine Elliott, Lord High Admiral. Actress is Doing Wonderful Work in Belgium With American Relief Barges" by Henry N. Hall.